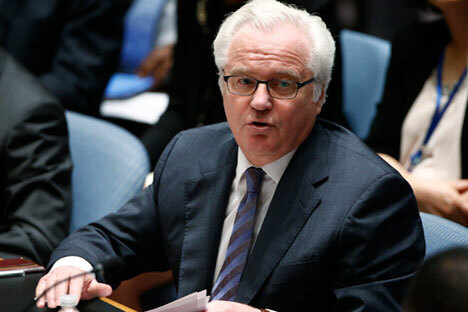 Russian Permanent Representative to the UN Vitaly Churkin. Russia's Permanent Representative to the United Nations, Vitaly Churkin, has said it is no longer possible to impose a no-fly zone in Syria, the initiative has come too late. When asked if it is possible to impose a no-fly zone in Syria, he said: "Not any more." "It is too late to talk about it. When all are flying and bombing, no-fly zones are not something to talk about it," the diplomat said, in an interview with the Kommersant FM radio station and the Kommersant daily. "It was the Americans who started bombing [Syria], now we have our aerospace forces operating there," he said. "So probably, theoretically, one could imagine, that in the process of implementation of the ceasefire agreement a proposal will be made not to use the airspace, but this question is purely theoretical, all the more so, given our presence in Syria," Churkin said.